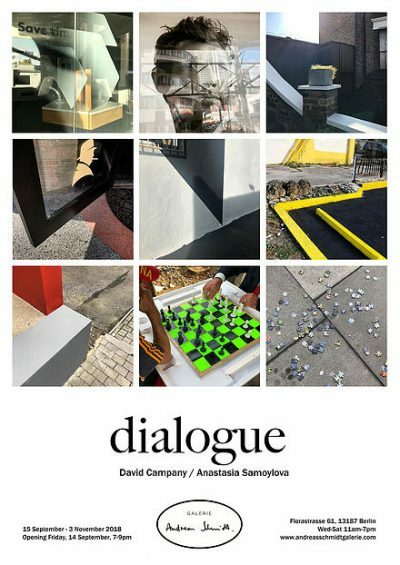 Dialogue is as a transatlantic visual conversation. David Campany (London) and Anastasia Samoylova (based in Miami) make photographs in response to each other’s photographs. No rules, no expectations. What has emerged is a long, winding, unbroken ‘sentence’ of observational pictures. It moves between theme and form, exploring reflexively the visual grammar, syntax, resonances, and conventions of contemporary imagery, all with a heightened sense of place. The project began in July 2017, on Instagram. Already there are over 3500 images taken in the artists’ home cities as well as Italy, Spain, France, Germany, Belgium, Holland and across the USA. For the first showing of the project, at Galerie Andreas Schmidt, Berlin, Dialogue was presented as a large split-screen video projection, accompanied by photographic prints. Lasting nearly five hours, the immersive image sequence can be entered at any point. In Feb/March 2019 Dialogue was part of ‘Smart at Photography’, a group show looking at various art practices using the smart phone, presented at Zephyr, Mannheim, Germany.